Review posted October 20, 2013. Schwartz & Wade Books, 2013. 40 pages. One hundred and a few-odd years ago, in Paris, France, there lived a humble postman named Lalouche. He was small, Lalouche, and rather bony, but his hands were nimble, his legs were fast, and his arms were strong. For company, he kept a finch named Geneviève. When Lalouche loses his job because the postal service wants to use the new electric cars, he sees an ad for boxers. 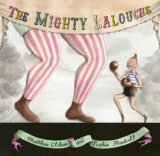 Lalouche is much smaller than the other boxers, but he overwhelms them with his speed and agility, and wins every time. However, despite all Lalouche’s surprising success, stationery stores with envelopes and stamps still make him sad. The happy ending turns that all around and makes the reader think about what success really means. So, it’s all a charming story. There are even photos in the back and an author’s note that French boxing was actually like that – where speed and agility could win out over muscle and bulk. But what makes this book over-the-top wonderful are the cut-out illustrations by Sophie Blackall. (Well, okay, and the way the story is perfectly paced to match them.) They have amazing attention to detail and wonderfully give the feel of nineteenth-century France. Let me strongly encourage you to check out this book and look at the pictures yourself. I have little doubt you’ll be charmed as well. I am going to feature this book in a “Family Storytime” at the library. It’s too much fun to keep to myself. For country, mail, and Geneviève!